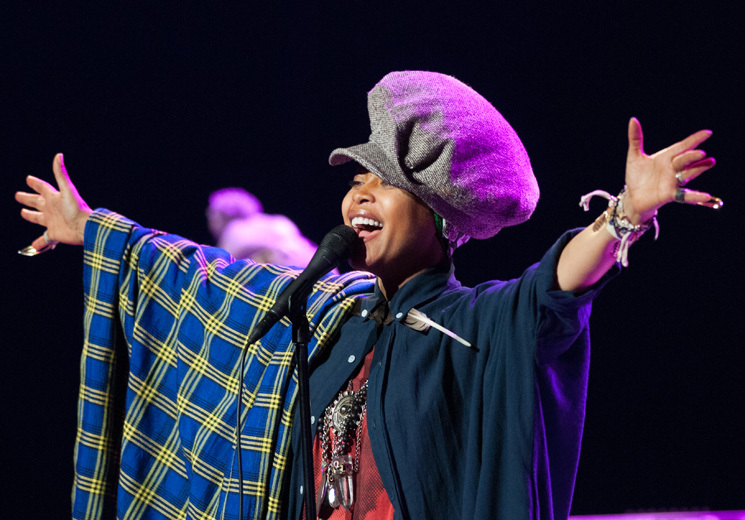 Erykah Badu caught a great deal of heat online earlier this week after saying that she "saw something good in Hitler" in a recent interview with Vulture, in addition to words of praise for both Bill Cosby and rapper XXXTentacion. Now, she's responded to the backlash in a series of tweets. Badu noted that "dialogue is cool. I invite it," before telling her followers to "read the article." She then accused the media of using controversial quotes and terms such as "click bait" to get you mad. "The media is banking on our ignorance. Know we won't read the whole thing. They'll use controversial quotes w/trigger words as Click Bait," she wrote. "We ❤️ controversy. So Blogs choose easiest thing to 'spin.' Get you mad. Help you get a little rage out. They get more adds. The message lost." She continued: "In trying to express a point, I used 1 of the worst examples possible, Not to support the cruel actions of an unwell, psychopathic Adolf Hitler, but to only exaggerate a show of compassion. "Either U read the entire VULTURE interview & U understood the message of compassion CLEARLY. OR U only read the selective, out of context Headlines, & were drawn in2 the whirlpool of collective emotional grief. I don't want 2 force U 2understand the way I love. I'm hopeful tho. And I still love you." Say what u must. Dialogue is cool . I invite it. But please do me a favor if you can , Black & Jewish Twitter, just don't use the word "problematic " any more. 😂Y'all using that too much . 🙄.. oh and read the article. The media is banking on our ignorance. Know we won't read the whole thing. They'll use controversial quotes w/trigger words as Click Bait. We❤️controversy. So Blogs choose easiest thing to "spin". Get you mad. Help you get a little rage out. They get more adds.The message lost.